Today I started my FT-5 to continue calibration and when I set ti to auto home Y motors wouldn't move. I've checked the voltage and it seems OK. Any Idea what to check next to what to do? Check your motor wiring and the calibration voltage on the step stick. The cross-overs at the splice are crucial. They must be as shown and where shown. Also, check that the splices are good and that the wire crimps at the terminals are good. The calibration is per Dustin Corbin's video, and it is best watched there. I don't have a link to it, sorry, but it is in the manual. I did that. The printer was working OK for one month but now I turned it on and Y axis is dead. OK, the time line was not apparent from the original posting. By "dead" do you mean as in literally no noises or residual torque at all, or just that it won't move? And is the rest of the printer OK? The auto homing implies that it is at least powering up. But as I recall Y homes first, then X usually. My printer is about 40 miles away at the moment so I can't check. Drivers can be fried for many reasons and are the weak links in the system. And they have been known to simply fail with no obvious reason, or from overheating. First double check the wiring for any pinches, shorts or separations and repair as needed. Then try swapping the Y stick with the one from the Z motion and see if the motors move. It doesn't matter if the current setting is wrong (for a few moments anyway), this is just to see if the original step stick is OK or not. If that doesn't work, re-load the firmware to the board. It is vanishingly unlikely that the motors are at fault. It is also unlikely that the main board itself is at fault, but that is not unheard of. Changed Y motors to different X and they work OK also checked wires and all are OK.
Changed drivers (step stick) from X to Y still no fun. Took new driver and put it to Y still nothing. Reuploaded Firmware 1.1.3 Still Y won't move. Is it possible that there is a problem on board itself? Unfortunately it is looking more and more like there is a board problem. 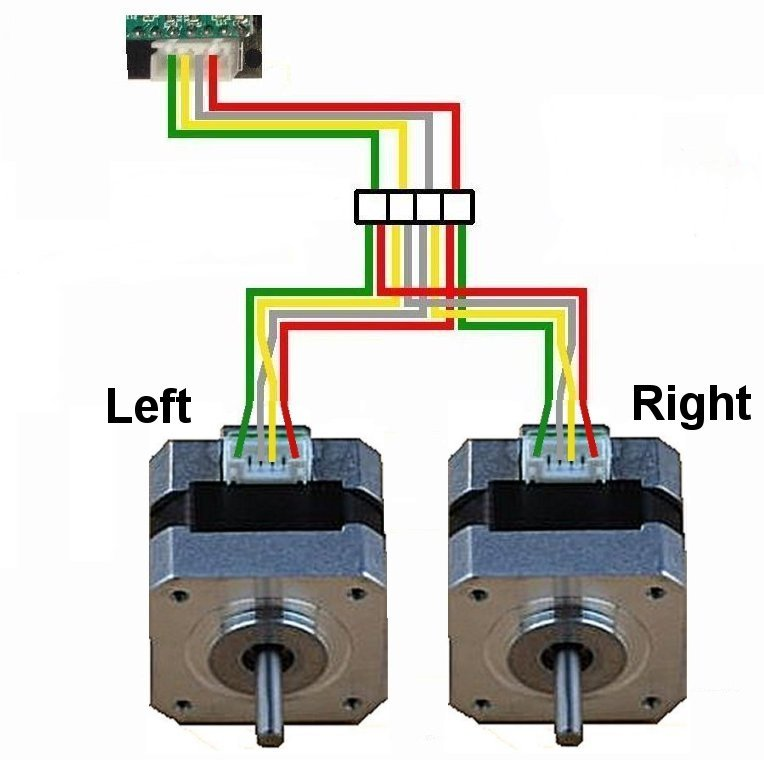 Because you changed the Y motor wires to the X channel and they ran (did I get that right? ), changed the step sticks around, tried a new driver stick, and reloaded the firmware, there isn't a lot left to be wrong. OK, just a crazy thought. This is admittedly a long shot but will cost nothing but a few moments of time to check. Unplug the Y home switch harness from the board completely (at the board). Then if the Y motion runs, there is a problem in the home switch or the wire to it. Again, this is a long shot but is still worth trying. If that doesn't solve the problem, sadly it is looking very likely that the board itself is at fault. But before you replace it, examine it very carefully for any cracked solder joints or un-soldered pins, especially in the step stick area. Tried to disconnect Y home switch but still nothing. What must I change to move Y axis output to E1 since I'm only using one extruder? At least for the time I buy new board. After several uploads of firmware it now started to move. I have personally written boot loaders for products, and in particular for Atmel MCUs. If the boot loader and the computer GUI that feeds it do not have robust error checking you can get into situations where it will appear to load properly but in fact doesn't. What probably should have been done would be to re-load the boot loader and the the firmware using the dedicated programming port (the six pin header near the processor chip). To do that however you would need a programming device of one sort or another, most typically an AVRISP or JTAGICE, and to tell it to fully erase the device before programming. The vast majority of the owners of these printers most likely will not have that hardware though. Glad to hear it recovered.